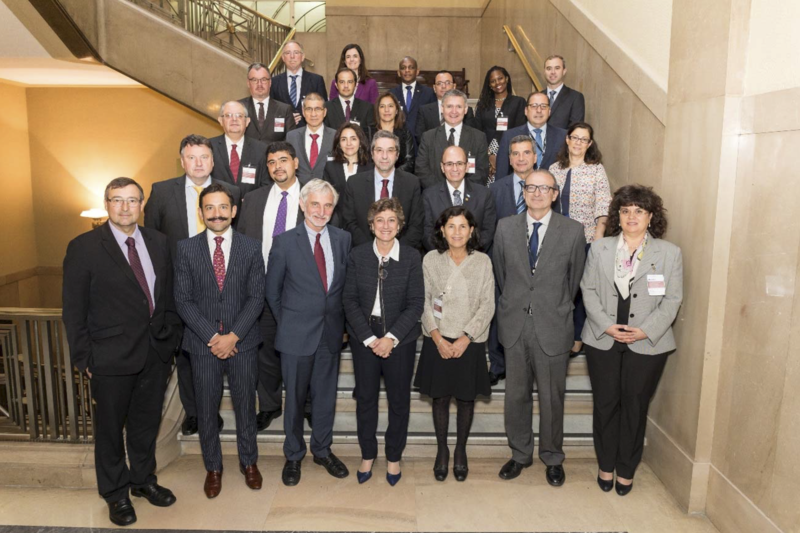 The IV Meeting of the CEMLA Financial Information Forum was held in Madrid, Spain on May 28-30, 2018, under the auspices of the Bank of Spain. The Financial Information Forum brings together the heads of statistics and financial information in central banks and financial authorities from Latin America and the Caribbean, as well as experts from other central banks and international organizations. The IV Meeting was attended by more than 30 delegates from central banks, financial supervisory authorities and international organizations that discussed: 1) the implications of new financial technologies for the statistical function; 2) the international efforts to enhance data harmonization; 3) the major developments in the statistical function at central banks; 4) the role of the credit registries and related recent developments; and 5) main novelties about statistical dissemination. A central aspect in the presentations of the sessions on the implications of the fintech phenomenon and on the progress in data harmonization, was to verify the change that has occurred in the role played by financial information and the statistics at central banks, which have become a strategic pillar. Numerous presentations put the focus on this change of focus, placing microdata as the core of statistical and financial information. On the one hand, due to financial technological innovations, the implementation of new infrastructures and platforms, changes in the expectations and demands of customers, as well as the appearance of new business models and operators. On the other hand, due to the growing number of responsibilities for central banks, with an increasing weight of ensuring financial stability and the proper functioning of payment systems. In general, the correct development of these functions requires the availability of high quality data and a high level of granularity. And all this being mostly reaffirmed after the financial crises (which have taken place at different points in time in Latin America and the Caribbean and Europe), unveiling the existence of statistical gaps that need to be covered. Finally, due to the growing perception that data is an essential asset for the development of the public service function performed by central banks. It has been necessary to introduce organizational changes to better address the statistical function (some examples are constituted by Central Bank of Chile, Deutsche Bundesbank, Bank of Portugal, ECB, Central Bank of Barbados, among others). - Conceptual (through the definition of data dictionaries [SDD] or the clarification of concepts in the field of technological innovation). - Technical and organizational (elimination of silos, constitution of Data Committees). Establishing rules for the governance of data. Generating more alternatives promoting data standardization and harmonization (LEI, BIRD, IReF projects are a good example in this regard). Need of new adapting capabilities, both human and technical, for data management (as it is the case of the Central Bank of Chile or the Bank of Portugal). Establishing criteria to strengthen coordination at different levels: between institutions, between central banks and entities, and between central banks and traditional and new players. Openness to the academic and research world, establishing data laboratories, with controlled external access (like the Deutsche Bundesbank and the Bank of Portugal). There is access to a large volume of information, but it is necessary to ensure that it is efficiently used. Advances in data integration take a lot of time and resources, but it is a requirement to increase efficiency and effectiveness in data management. - The integration of financial and supervisory information is at a more preliminary stage and faces greater difficulties in which a strategy is required to overcome existing barriers. - Data load for reporting entities is increasing and, therefore, the pressure grows for a more efficient use of already available information at the central banks, as well as a balanced treatment for new players (fintech). - Its design will be one that strikes a balance between, on the one hand, fostering innovation and, on the other, preventing the emergence of risks that compromise financial stability. It will be also important to avoid favoring arbitrage. - Ensuring that the availability of more information helps to strengthen market discipline and regulatory compliance. - Strengthen international coordination between central banks and other relevant authorities in this new context. Data management in credit information systems must occur in a balanced context of transparency and privacy. This may represent an important challenge for credit registries due to the greater availability and use of alternative data to assess credit worthiness. Cybersecurity is a new challenge faced by credit registries for the management and transmission of information. Credit registries must ensure that there is a culture of using only reliable sources, as well as controls to ensure the quality of the information. Possibility of using information on debtor’ behavior to favor financial inclusion, aiming at properly exploit their positive data. On the other hand, in terms of inter-institutional cooperation, it was stressed the importance of achieving adequate coordination and communication between central banks and financial supervisory authorities in order to achieve an adequate data sharing framework that facilitates to each authority developing their very own responsibilities. At a regional and international level, this requires a greater effort, and for this the AnaCredit project has demonstrated the importance of the commitment at the highest level to coordinate an adequate integration of financial information, in this case in the European context. Throughout the different sessions, it was underlined the need to ensure quality standards of the information that is collected and disseminated, as well as the importance to guide users’ expectations in relation with the vast amounts of information that central bank and the financial authorities can disclose, which are responsibilities for the statistics and financial information departments at central banks.